What’s it about: Magic pony cast on their exciting challenges and adventures. Visit our site to purchase a single issue or subscription to My Little Pony magazine. Hasbro’s My Little Pony was originally launched as a toy line for girls in 1981. The original line ran globally from 1982 and later discontinued in 1995 due to increased competition; they were later resold in 1997 but unfortunately discontinued again in 1999 as they proved being unpopular. My Little Pony is entertaining, funny, and above all EPIC! The magazine first debuted as a triweekly print in 2012, based on its roots from the hit animated series from the 80’s intended for viewers aged 2-11. It is known as the cartoon that changed the world. 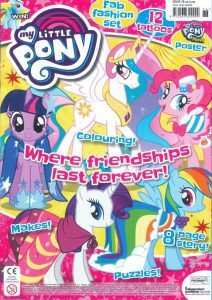 Each issue comes with an exclusive My Little Pony gift and is jam packed with fun stories, comics, puzzles, games, posters and craft ideas. The message and morals of the show are very prominent and are shown through the importance of friendship. Every issue is always inspiring and thought-provoking as you learn the show’s outlook on life. My Little Pony consists of six main characters known as the ‘Mane Six’: Twilight Sparkle, Rainbow Dash, Pinkie Pie, Rarity, Apple Jack, Fluttershy, and Spike, the ponies each have colourful bodies, manes and a symbol on one or either sides of their flanks; the symbols are referred to as ‘cutie marks’. Each character is designed to depict a different element and a positive aspect of friendship and all have very personifying characteristics. All the characters are memorable, lovable and all have vivid personalities which each have their ups and downs. They are brought together by the Elements of Harmony. 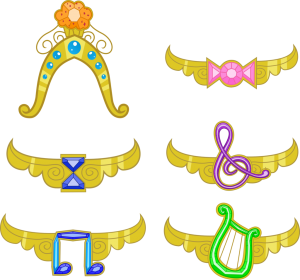 The Elements of Harmony are a set of six supernatural artefacts demonstrating particular aspects of harmony and are the most powerful magic known to ponydom; these were taken from the Tree of Harmony by Princess Celestia and her sister, Princess Luna. By doing so this had the potential of releasing the Everfree Forest and destroying Equestria; each artefact represents an element of friendship and is only activated if the wielder possesses the matching trait. Join Twilight Sparkle and the rest of the pony gang for fun, play and adventure – a must-have for all My Little Pony fans! Previous Previous post: Draw, make and play…the CBeebies way! Next Next post: Win a visit from a Beano Artist for your School!